800 mg of EPA/DHA per 1000 mg Softgel - One Softgel a Day! Omega 800, by California Gold Nutrition®, exclusively uses KD-PÜR® IFOS™ 5-Star Rated Fish Oil Concentrate processed in Germany and was specifically designed for individuals looking for an ultra-concentrated, once-daily softgel dosing. 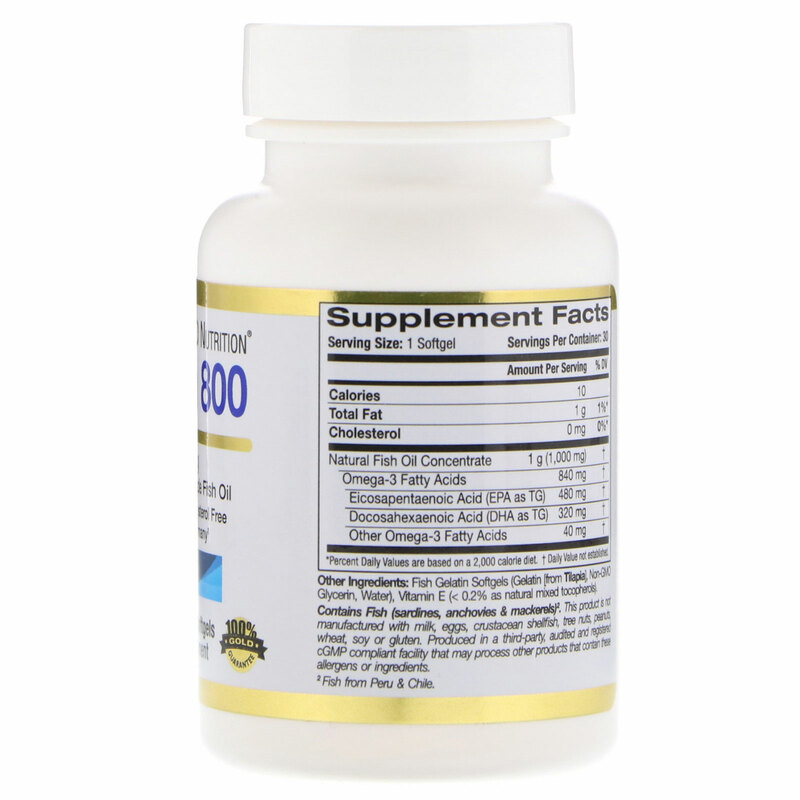 Per dose, Omega 800 offers the highest quality fish oil, with no less than 800 mg of EPA/DHA, at the at the best overall value. Why KD Pharma Fish Oil? Take 1 softgel daily, with or without food. Best when taken as directed by a qualified, healthcare professional. 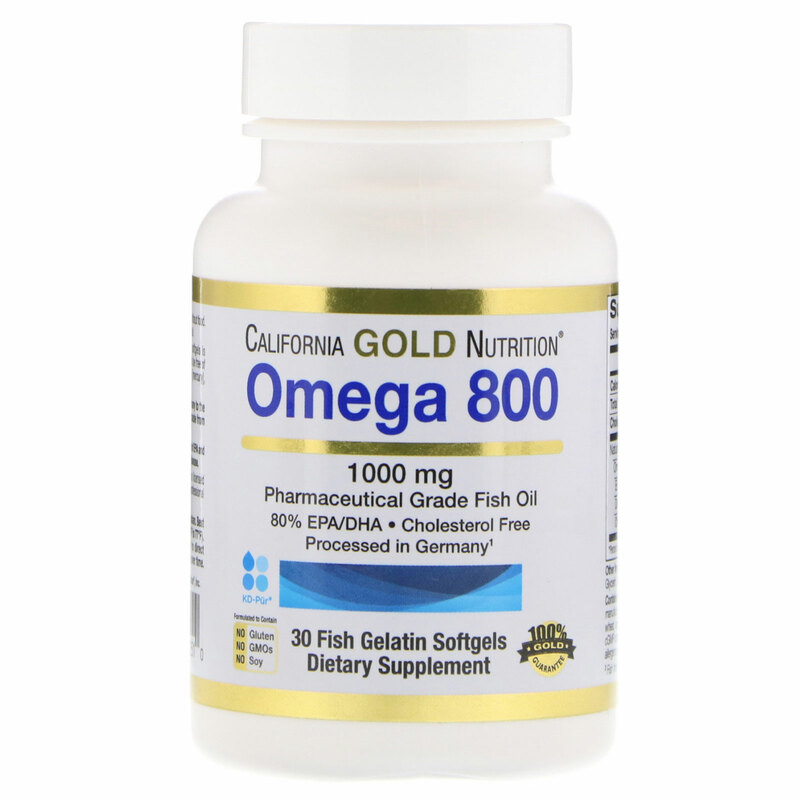 The ultra-concentrated Fish Oil used in our Omega 800 softgels is manufactured under strict quality control standards. It is tested to be free of potentially harmful levels of contaminants (e.g., heavy metals [mercury], PCB's, dioxins, and other contaminants). ¹Contains fish from Peru & Chile (sardines, anchovies & mackerels). 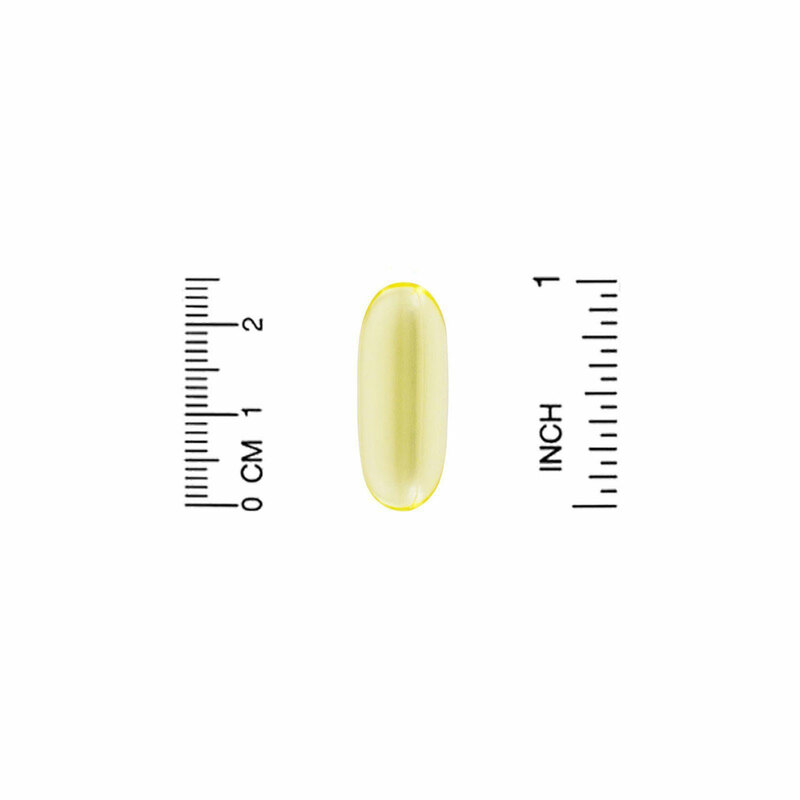 Fish Gelatin Softgels (no porcine & no bovine), (Gelatin [from Tilapia], Non--GMO Glycerin, Water), Vitamin E (< 0.2% as natural mixed tocopherols). The Fish Gelatin used in our softgels is approved for pharmaceutical, nutraceutical and foods and meets all world regulatory health standards (e.g., U.S., EU, USA, Korean, Japanese, Canadian and Australian Regulations). †Supportive but not conclusive research shows that consumption of EPA and DHA omega-3 fatty acids may reduce the risk of coronary heart disease. Not manufactured with milk, eggs, crustacean shellfish, tree nuts, peanuts, wheat, corn, gluten, salt, starch, sugar or yeast. Produced in a third-party, audited and registered cGMP compliant facility that processes other products containing these allergens or ingredients.